Update, Febr. 29, 2012: Current Rick Warren controversy: Do Christians and Muslims worship the same God? According to Rick Warren, they do… says a California newspaper. The Rev. Rick Warren, pastor of Saddleback Church in Lake Forest and one of America’s most influential Christian leaders, has embarked on an effort to heal divisions between evangelical Christians and Muslims by partnering with Southern California mosques and proposing a set of theological principles that includes acknowledging that Christians and Muslims worship the same God. WARREN: Sure. All three of those statements are flat out wrong. Those statements were made by a reporter, not by me. I did not say them … I do not believe them… I completely disagree with them … and no one even talked to me about that article! America’s New People’s Pastor: These are heady times for Rick Warren. His book The Purpose Driven Life, which says that meaning in life comes through following God’s purposes, has sold more than 20 million copies over the past two years and is the best-selling hardback in U.S. history. When he took the podium to pray on the final night of Billy Graham’s Los Angeles crusade at the Rose Bowl in November, the 82,000 congregants cheered as if Warren had scored the winning touchdown. And on the eve of the presidential Inauguration, Warren, who pastors the 22,000-member Saddleback megachurch in Lake Forest, Calif., delivered the Invocation at the gala celebration. Later he met with 15 Senators, from both parties, who sought his advice and heard his plan to enlist Saddleback’s global network of more than 40,000 churches in tackling such issues as poverty, disease and ignorance. 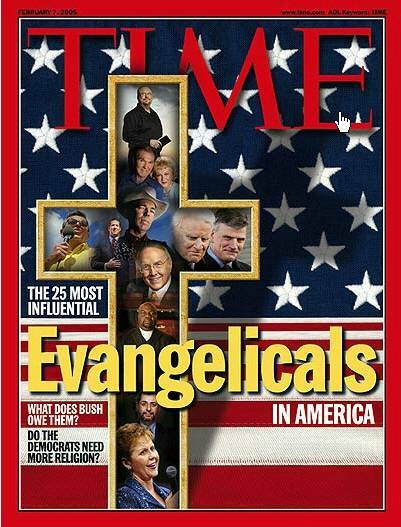 And when 600 senior pastors were asked to name the people they thought had the greatest influence on church affairs in the country, Warren’s name came in second only to Billy Graham’s. Although Franklin Graham is heir to the throne of the Billy Graham organization, many believe that Warren, 51, is the successor to the elder Graham for the role of America’s minister. Rick Warren is praising Obama for inviting the homosexual bishop Robinson to lead prayer during Tuesday’s ceremony. RW also said “Obama has again demonstrated his genuine commitment to bringing all americans of ‘goodwill’ together in search of ‘common ground.’ I do not believe anyone who compromises their beliefs to please others, has a true desire to please God. It seems RIck Warren wants to insure the continued success of his book sales, if he also can spread enough goodwill and be a people pleaser he will continue to have high profits. The idol worshippers who are following the wanna be people’s messiah are selling their souls. There are so many who want to attain popularity and prosperity no matter the cost. Their conscious is seared, as in promoting bishops who engage in perverse homosexual acts, supporting someone who believes and who voted for innocent babies to be murdered while being born. I believe God is standing back and has been watching to see who will stand for righteousness, and who will compromise the word of God. It is a fearful thing to fall into the hands of an angry God. True christians need to be interceding for those who are decieved in these last days. I am sickened. We serve an unchanging God I pray His people will STOP comprimising the Word of God and stand up for His truth whomever it may offend. We need to pray! If he has this influence, we need to pray that he repents and does so publicly. Yes, he is misguided and carries ecumenism too far. But he is basically a misguided evangelical, and God can use him still. We need to not toss people aside so easily. We need to remember we also have bad judgment. I once had the same prespective he has, and the Holy Spirit caused me to see my hypocrisy and wrong ideas, bringing me to repentance. We serve a God who loves abundantly; let us too, love abundantly. The church is truly in the grips of apostasy and the mire of a lack of discernment. How can the leadership of the Southern Baptist Convention and certain apologetic ministries allow (1) Rick Warren to promote mysticism, i.e. breath prayers as found on page 88-89 of his book the Purpose Driven Life and (2) promote the working together by involving people of different faiths and their religious institutions (Jewish, Muslim, Buddhist and Christian, etc. )to solve the worlds problems without saying a word. Did any of the Old Testament Prophets or NT apostles quote form the demon led or possessed priests or prophets of the world religions as a source of inspiration, enlightenment or pursue working relationships with them to help build the kingdom of God. No! As a matter of fact the Bible exhorts biblical separation. (2 Cor 6:14-17, Amos 3:3) yet Rick Warren is promoting the opposite. In light of the clear evidence from Rick Warren himself, one is left with the question where is the discernment, and allegiance of pastors and teachers within the church who are promoting and supporting Rick Warren initiatives such as his PEACE plan and his books “Purpose Driven Church”, and “Purpose Driven Life”, etc. This clearly shows how far the institutional church has traveled down the road of Apostasy. The Apostle John’s criteria for gauging our relationship with God are by whether we follow or deviate from Christ’s doctrine (2 John 9). We are explicitly warned not to allow false teachers to teach in our churches (at that time homes) nor give them any encouragement (v. 10). If we do, we take part in their evil deeds (v. 11). By way of extension this would include the buying and selling of their books and materials, teaching their messages and methods to others. If we do, we take part in their evil deeds. Yet there are churches that sell their books, teach from them, and adopt their messages and methods. This is heresy by proxy. They appear to be oblivious to the dangers that are presented. These indeed are perilous and deceptive times. How sad it is that so many are writing books, and promoting them from the pulpit. I think that it is a tragedy that so many pastors are actually pushing these books in there churches. Guess what God left the only book we need. The Bible. I know that some mean well others are money hungry I must admit I am deeply saddened by the mega church movement. What is more important a big church or a Holy Church? Bible studies are fading and some pastors are pushing these books to be studied instead $$$$$ these salesmen are selling books on how to be a good christian. Read the Word the Bereans did, and Paul commended them for it. Don’t just believe a pastor, or priest because he said it. We have God’s word at our disposal. The truth will set you free. My prayer is that believes will begin to stand up for the Word, revival will not come with concerts in church or reading some second hand account on the bible. Revival starts with God and Pours down. Obedience. To God Alone Be The Glory Forever. Amen. I agree with you John. While some of these books may be “great reads” I feel that alot of times they make us lazy. If we are using these to serve as doctrine are we any more correct than the Mormons? No. I love that I can take that I am an imperfect human saved by Gods grace. No other experience will move you like being alone with God and in His Word. My Church is big but I know it is right for me by spiritual affermation not “increases in my finances” or any other material gain. Believe me I live in the land of some of the most money driven preaching there is. I am ashamed that so many are lost because they have been lured in by the thought of properity preached in these books. Our country needs those like you and me to be doing what God has truely called us to do. Thank God for is Word and fellow believers as yourselves. Rick Warren and all of his mixing with the cults is leading spiritually minded Christians towards a One World Religion. While he is not the anti-christ, he is an antichrist. Wanting to merge all the religions of the world together in the common cause of bettering all of humanity is just the talk of a typical Wolf in Sheeps Clothing. i disagree with Rick Warren’s statement, “it is ALL about God and not about you”. It does NOT measure up with the word of God, just read John 3:16. Our whole life basically consists of God saving his special people, and in turn, God reaping what He sows, which is eternal life– knowing God and the one whom He sent Jesus the Christ who became flesh and ALSO said we ought to love one another. According to 1 John we ought to not even greet Rick Warren in some ways, because he did not bring the doctrine to love one another. 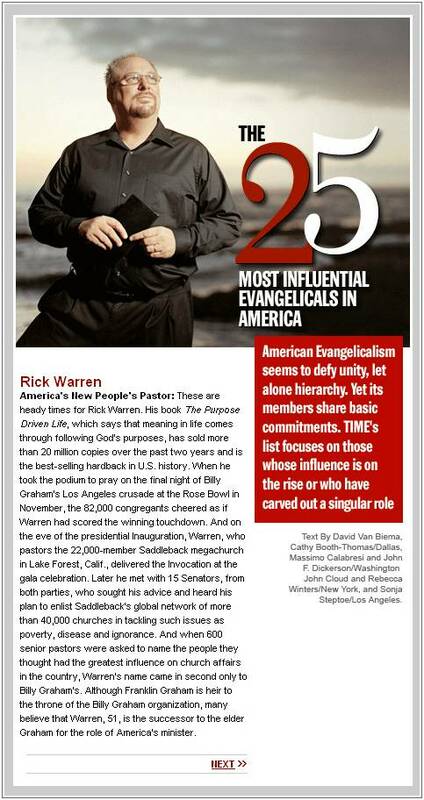 Did those of you who are critical of Rick Warren for embracing Pres. Obama ignore the fact that Daniel served King Darius a pagan King and even said to him “Oh King Live forever”! Do you recall how Jacob blessed a pagan King that had put his son Joseph second in command of his pagan Kingdom! Yet many of you disrespect Pres. Obama whom the bible said to pray for, not against! Mormon God is not the same as the Christian God. Their Doctrine is polar opposite and you will never see a Cross over their Church nor do they acknowledge Jesus death on the Cross as essential to our Plan of Salvation. Why is Beck given a pass and not called into question about his faith but Obama is? Did not the bible say do not unequally yoked with unbelievers yet many Christians are his fan club and never call into question his claim to be a Christian and a proud Mormon when you know that is not possible, and is an out and out lie. If you are going to look the other way on Mormonism the least you can do is shut up about Rick Warren already! Who is promoting Glenn Beck as a Christian here? Please point them out because I couldn’t see any. You are right that Beck is clearly not Christian. What I don’t understand is why that has to be a discouragement against the call to expose false prophets. I am compelled to not stay silent about the dangerous compromise I keep on seeing with Rick Warren, yes there are others, but Warren is the specific topic over here. Sue: your point is well stated and is certainly valid as far as it goes, but it does not mitigate or eliminate the postmodernism, syncretism, and nascent monism so obvious in the worldview and teachings of Rick Warren and of the “emergent church” of which he is a part. You’re right to say that Glenn Beck’s Mormonism ought to be rejected by orthodox Christians. So should Obama’s religious left, secular humanist liberation “theology”. And so should Warren’s postmodern social gospel and “secular evangelicalism”. In the horrible “new world order” that has been wrought by the forces of postmodern secular humanism, it is very tempting for Christians to want to ally themselves with people who are in positions of temporal or political or financial power in this world. This is why so many believers have looked the other way while rubbing elbows with the Glenn Becks of the world. That is, sure he may be a Mormon, but at least he is a theistic thinker, and that alone sets him apart from the secular left and “the enemy of my enemy is my friend” and so on. Now, I won’t say that in a purely pragmatic, here and now sense, we should overlook the contribution someone like Beck makes to the political process in this country, because that contribution stems from a worldview that is less hostile to orthodox Christianity than does Obama’s one world, secular humanist monism pretending to be 1960s liberal Christian activism (itself largely apostate at the time and now completely so). But Christians should certainly be far more careful about linking hands with Mormons or with anyone else, actually. I do think that doing so is acceptable provided no idolatry is taking place; the point at which “conservative activism” becomes antichrist is the point at which it demands renunciation of the Jesus of Scripture and his replacement with either the mushy “civic god” of Americanism or—worse—with “other christs”. And of course, any “Christian” who is putting their hope in any “savior” other than Jesus Christ of Nazareth had better take a long, hard look in the mirror and in the mirror of the Word. In other words, while we may, and should, “work out our faith” in the public arena, that is not the same thing as placing our hope for our lives in the here and now into the hands of politicians, or soldiers, or of anyone or anything else other than Christ. You seem to have some anger there. Are you a Warren supporter (just asking)? It seems to me that you are talking to or about two different groups but mixing them together. Christians who support GB are usually those who also support Warren and his heretical /unBiblical teachings (Newage Sewage parading around in Christian garb). I do NOT give Beck a pass. Most Christians who show any support at all for GB (and I am NOT one of them) simply support that he is pro-freedom, pro-America. Those who support RW are simply blind or naive or both. I agree with you that supporting one of them while castigating the other is hypocritical but the only RW supporters I know of are Ecumenists who would also NATURALLY support Beck as they would want what Warren wants – unity among all religions so that we can all sit around the fire and sing Kubaya. I don’t see anyone supporting one and questioning the other. Eh bien, both GB AND RW have flawed theology. Can’t stomach either one. I am not entirely convinced of what RW has done wrong. Did he really say, or promote the things that people are saying about him, or is it hearsay? He seems to be denying these things. Is this double speak on his part, or is he being maligned and villified? Are his words being misquoted or taken out of context? The left does this to the right all the time. Let’s be careful not to do it to fellow Christians. Let the truth be established by the testimony of two or three witnesses (who have first hand knowledge). Also, I would like to know exactly what aspects of The Purpose Driven Life are clearly unbiblical.